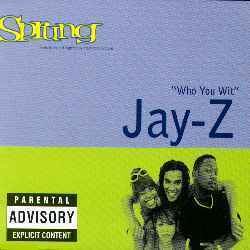 "Who You Wit" is a 1997 single by rapper Jay-Z that is produced by Ski. It was released in promotion of the 1997 comedy film Sprung and appears on its soundtrack, Sprung (Music from and Inspired by the Motion Picture). Its beat samples "Night Love" by the Jeff Lorber Fusion. A track named "Who You Wit II" appears on Jay-Z's second album In My Lifetime, Vol. 1. It features the same beat, but adds an additional verse that the original version lacked.